The ADIPEC Awards recognise the leading companies, individuals, initiatives, projects and technologies which have displayed a level of excellence on an international scale. Through five Award categories, companies are given the opportunity to be recognised and ultimately awarded for their accomplishments within the areas of research, technological innovation, digital transformation, performance & efficiency, social contributions, personal achievement and business progression. In order to be in with a chance of receiving an industry recognised ADIPEC Award. Technological Innovation and Research will recognise a programme, project, product, study or service which showcases an innovative breakthrough for the industry. The research piece or technological innovation must showcase a new and unique concept with regards to innovative-thinking, quality, cost improvement and practical considerations within its environment. The information submitted can focus on research and technological innovation in MENA and non-MENA regions and should also focus on the period between April 2016 and June 2017. The Best Digital Transformation Project will recognise outstanding implementation of a digital oilfield (DOF) project that is innovative, value-enhancing and has a noteworthy return on investment. This award is open to all projects in the oil & gas industry, from exploration & production, to refining, distribution, marketing and retail. The information submitted can focus on the MENA or non-MENA region and should also focus on the period between April 2016 and June 2017. With significant reductions in E&P expenditures across the globe over the past two years, it has become imperative for all players in the E&P value chain to focus on end-to-end performance, overall process efficiency & cost optimization. This category will recognise a project which has positively impacted field performance, recovery rate, and project delivery schedules whilst maintaining the highest standards of HSE & asset integrity. The information submitted can focus on the MENA and non-MENA regions and should also focus on the period between April 2016 and June 2017. HSE & Asset Integrity – review the HSE framework guiding the project and outline the introduction of new technologies to drive improvements in HSE KPIs and to ensure asset integrity. The Award for Social Contribution and In-Country Value recognises the efforts made to the betterment of the wider community & environment and the in-country value thus provided. The entry must highlight how the environment & country benefitted and what the measurable impact was. The successful entry will demonstrate how total spend has been retained in-country to benefit business progression and contribute to human capability development, stimulating the country’s economy. The information submitted can focus on the MENA or non-MENA regions and should also focus on the period between April 2016 and June 2017. The Young ADIPEC Engineer category recognises a male or female engineer who has begun his or her career in the oil & gas industry and has less than four years’ experience. During this time, he or she will have shown their ability to become a key contributor to the future development of the oil & gas industry and a strong potential to reach senior management level. The applicant must highlight their educational achievements in addition to the successes in their career. The nomination must be submitted by the candidate’s Line Manager, if the entry is submitted by the candidate, it will not be accepted. The information submitted can focus on an individual from inside the MENA region or outside the MENA region. If your entry is a resubmission of 2016, it will be necessary to provide an update for the period April 2016 and June 2017. You will need to demonstrate developments in efficiency, more effective implementation, improved outcome and so forth (not relevant for category 5). Please submit your entry today by clicking here. The deadline for entries is 26 July 2017. 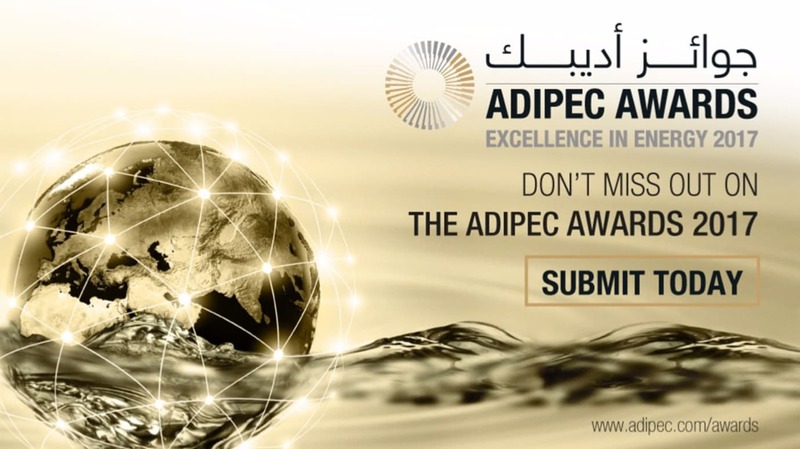 For more information, please visit the ADIPEC Awards website.